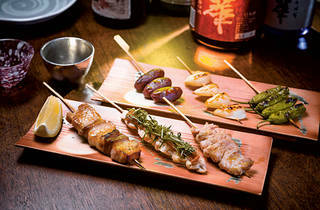 To call Shiba, a new cosy yakitori shop in Kennedy Town, a restaurant wouldn’t be entirely correct. 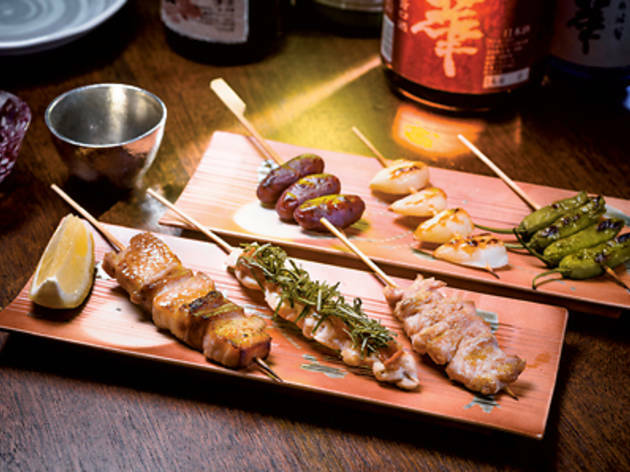 Inspired by back alley watering holes in Tokyo district Ginza, where white collar workers gather after work to drink and socialise, Shiba is more like a Japanese drinking bar serving yakitori – albeit extremely high quality yakitori. The 30-seat eatery on a quiet street near The Merton features wood panel surrounds, a bar-counter and ample bench seating. It’s hard to miss the impressive ‘sake wall’ too – the central feature of the venue. The owner, who also runs a sake bar on Peel Street, directly imports the beverage from Japan and touts it by the bottle and the glass. Classics include both Daiginjo and Jumai Daiginjo, Honjozo and a solid collection of Shochu. On our visit, we’re tempted by a glass of the Kurabito Strawberry Sake ($58) and the Koshino-Tamashii Junmai-Ginjo ($78), which is considered a finer sake as it uses high quality rice and has a purer taste. They’re both instant hits, as is the sweet Hatsukoi Plum Wine ($48), which is easy on the palate. A grill area at the bar is where three chefs skewer, season and broil a variety of meat and veggies. The selection is hardly exotic but, for the prices, it’s superb value. We try the grilled tomato ($18), which is plump, juicy and bursting with sweetness. The same goes for the asparagus ($26) – lightly seasoned with white pepper, it’s fragrant and devoid of any bitterness. Chicken is done about 10 ways at Shiba. We try the homemade shiso minced chicken ($34). Part of the mint family, the shiso leaf, when grounded, mildly resembles basil in taste – but it’s a lot lighter. It’s a refreshing way to do a perennial favourite. Other worthy bird parts to sample include skin ($24), neck ($24) and plump thigh meat with scallions ($28). There aren’t many red meat choices except for the lamb chop ($58) and the Kalbi ribs ($48) but they’re both solid offerings without any surprises. And the rice in bonito soup with mentaiko ($48) is fab. While minced cod roe is generally too pungent to eat on its own, mixing it with the soupy rice enhances the flavour of the broth. Shiba Shop E, G/F, May Sun Bldg, 11 Smithfield, Kennedy Town, 3568 2425; keyakihk.com/shiba. Dinner for two: $600.